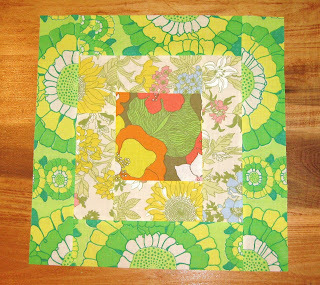 Here's the October block for my quilting bee. Wen is making a bento box quilt out of thrifted sheets. 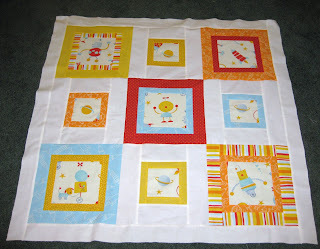 She'll cut each of these blocks into four, then shuffle them and sew them back together, like this. 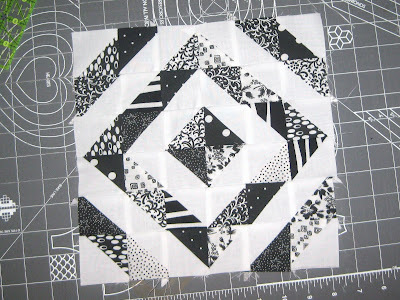 Can you tell I'm using up all my black and white scraps? Here's my last notepad cover. On to new things now. At 16 1/2 by 16 1/2, this turned out perfectly for a pillow form - no idea how that happened :). It ended up being a lot of work with 200 triangles, but I like how it's turning out. I've finished my first handmade Christmas gift. I used my own tutorial, so I know it works :). 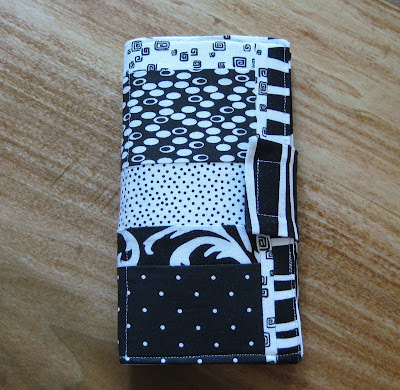 On its own, or pair this up with a key wristlet, tissue cozy and/or checkbook cover, and you've got a great gift! I've seen so many gorgeous quilted pillows on flickr, I just had to start one for myself. Now that I've started it, I'm not sure why I made the triangles so tiny! This is only 10 inches square! 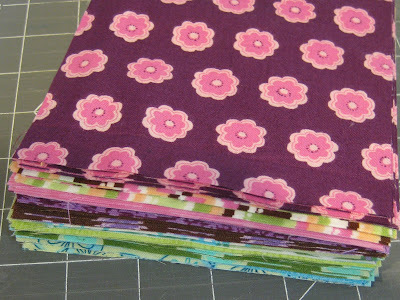 I think I want to use a 16 inch pillow form, so I've got more piecing to do. Here she is all pieced. 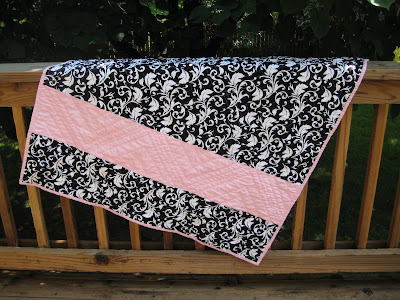 I'm thinking about piecing a back of all white with one zig zag row across. 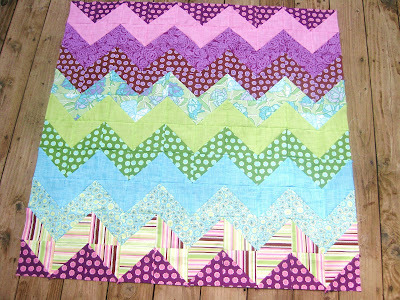 I'm not very satisfied with my color arrangment in the quilt, but I did really enjoy learning a new technique, making a zig zag quilt for the first time, and working with a very saturated fabric line. Fun! 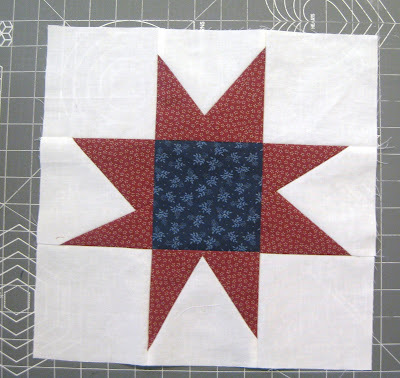 AmandaJean over at Crazy Mom Quilts asked for contributions of wonky star blocks to make two quilts for Quilts of Valor. I decided to pitch in. She links to a good tutorial. As you can see I need to work on wonkiness, but I think it is good for a first try. I've joined my first quilt along! 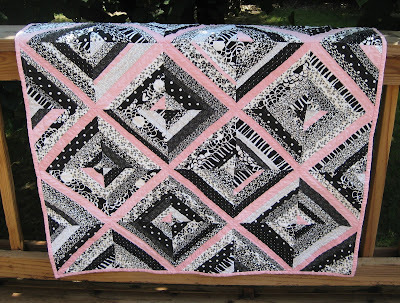 This is the first four rows of the zig zag quilt by Park City Girl for the Old Red Barn Co Quilt Along on flickr. The triangles are definitely a little fiddly, but I've found as long as I pin carefully I'm not loosing any points on my zigs or zags. Fun stuff. If anyone is interested in joining along, Park City Girl's directions are super! 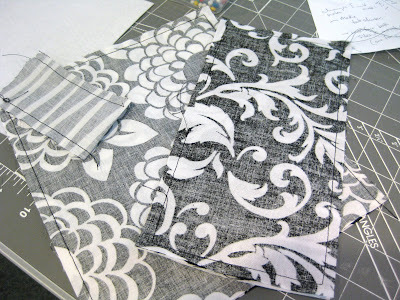 Enjoying working with some fabric from the Urban Garden line. Anyone want to guess what my newest project is? 2. All seams are 1/4 inch. 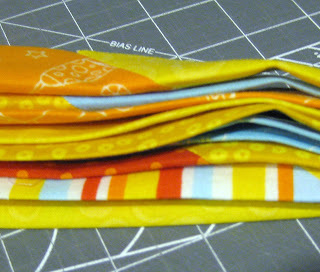 Sew the two pocket strips together lengthwise and iron open. 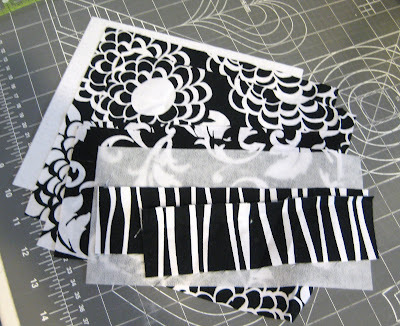 Iron the fusible interfacing to the wrong side of this rectangle. 3. Right sides together, sew pocket front and pocket lining together, leaving a 2 gap for turning right side out. 4. Fold the flap closure in half widthwise, right sides together, and sew down two long sides, leaving the short side open for turning right side out. 5. 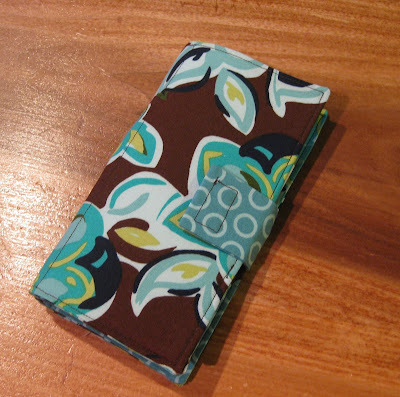 Rights sides together, sew cover fabric rectangles together, leaving one short side completely open. 6. Turn all shapes right side out after clipping corners. Iron. 7. 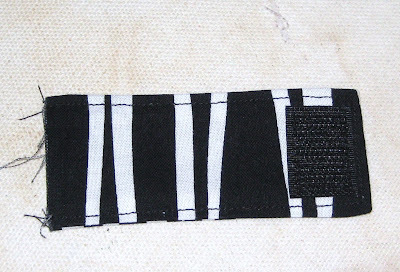 Top stitch along three sides on the closure flap. 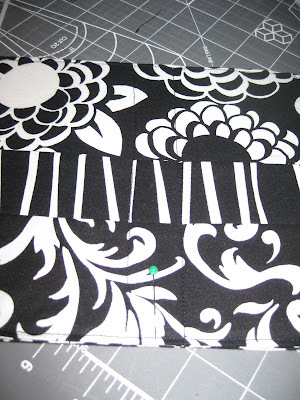 Sew one piece of Velcro onto the finished short end. 8. Trimming as necessary, slide the InnerFuse piece into the cover fabric rectangle. Turn the raw edges under. Slip raw edge of the closure flap into this end, at the center. Iron the whole rectangle to fuse. 9. 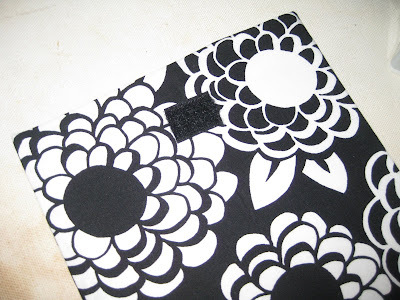 Sew the other piece of Velcro onto the front of the cover in the center right side (test for placement by folding the flap over the front as if closing the notepad cover). 10. 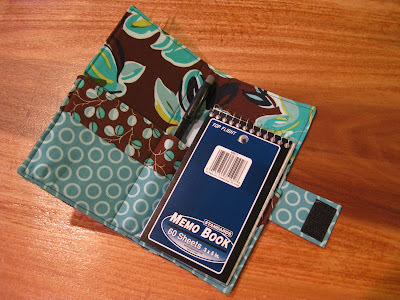 Pin the pocket piece onto the cover fabric rectangle. 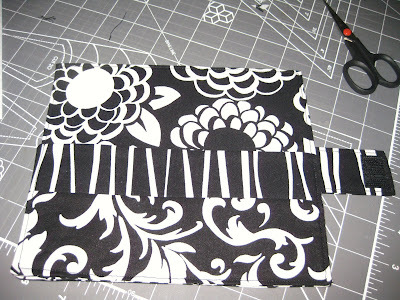 Top stitch around the larger rectangle (this attaches the pocket and the flap to it at the same time). 11. Find the center of the long end of the cover. Mark with a pin and stitch ½ on either side of the pin, top to bottom (this will make a pocket for the pen). 12. Slide in your 3 by 5 notepad and pen and enjoy! 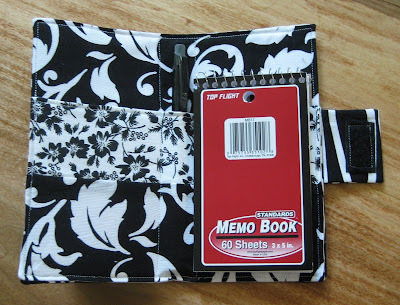 The pocket to the left of the pen is great for coupons and receipts too! 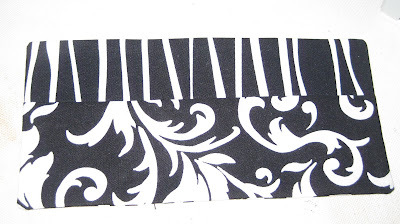 *InnerFuse is a fusible product that is a lot more heavy weight than regular interfacing. It is almost the weigth of cardstock but a bit thicker. I used the medium weight kind - available at places like Joanns. 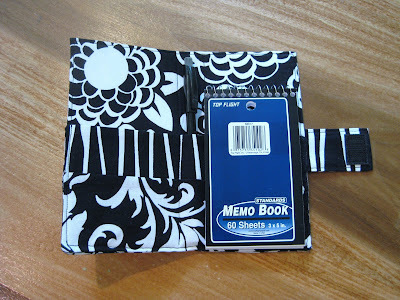 Using this product makes the notepad holder feel like a book. 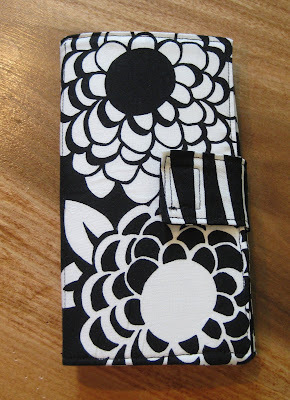 I tried using interfacing, but even with two layers the holder was just too floppy. Tutorial for personal, not commercial use. Please let me know what points are unclear or if you have any questions, and I'll revise the tutorial! Enjoy!! 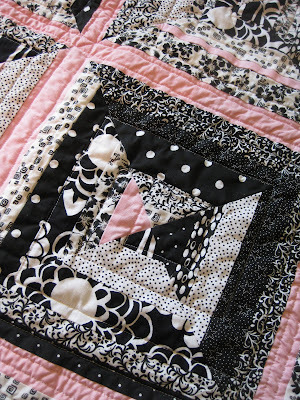 Still working on the tutorial for this quilt. 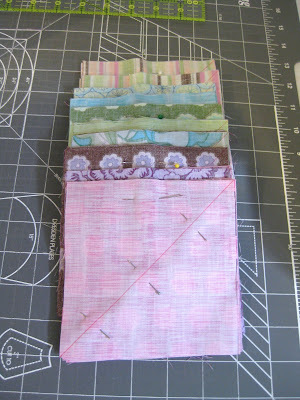 Got the top together and a fun pieced binding ready to go. 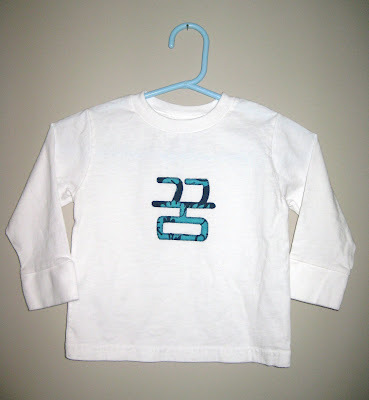 These two shirts are appliqued with the Korean word for Dream, pronounced ggoom. The Korean alphabet is called hangul. I think the words are graphic and beautiful (not always easy to applique!). 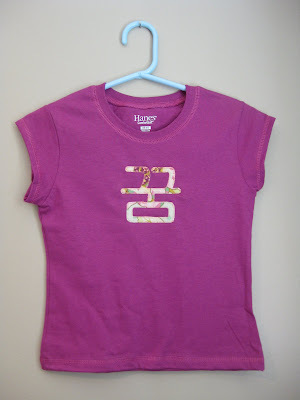 There's not much available out there in the way of kids clothes with hangul embellishemnts. Now there are two! Check them out in my etsy shop. Here she is, all finished. 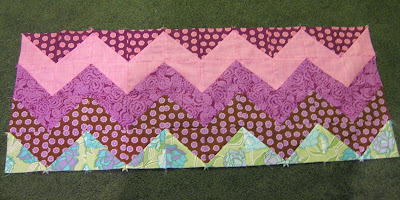 I did straightline quilting following the sashing and then a square spiral in the centers of the blocks. 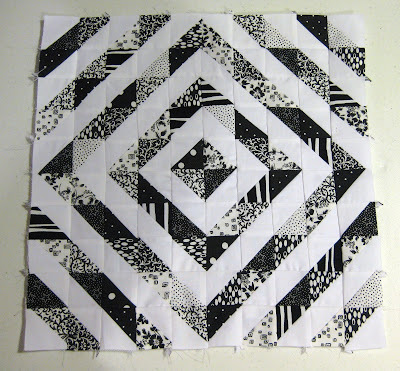 The final quilt measures 40" x 40".